Settlement along the river Vecht (Utrecht, Netherlands). 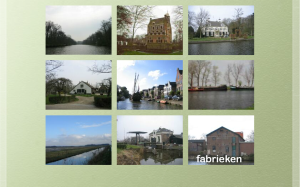 This Flash application provides a visual integration of cultural and historical information about settlement in the basin of the river Vecht. Co-production of the Vechtplassen Commissie and the Utrecht University (see credits in the application). Right in the heart of Holland, a stone's throw from the city of Utrecht, lies Slot Zuylen. It is situated within the boundaries of Oud-Zuilen, one of those dreamy little villages along what is often considered Holland's most beautiful river, Vecht. 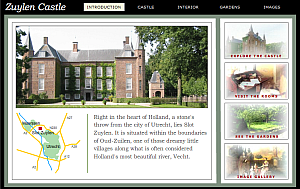 This interactive application shows the history of the castle (amongst other by means of a 3D model), the interior and the gardens. Peat lakes are a distinctive feature of the wetlands in the Netherlands. They are a convenient starting point for a better understanding of the ecosystem of the peaty soils, which make up most of the western part of the country. 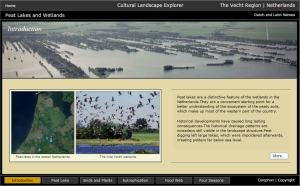 This multimedia application contains an animation of the lakes' eco system, the food web and an overview of birds and plants life. 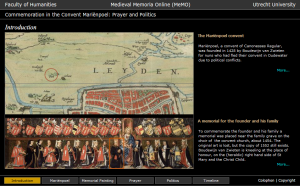 This interactive multimedia application offers an introduction to the medieval commemoration of the dead (also called memoria) in the Mariënpoel convent (near the Dutch town of Leiden). It was founded in 1428 by Boudewijn van Zwieten for nuns who had fled their convent in Oudewater due to political conflicts. This application aims to introduce you to the medieval memorial culture in this convent. It was made in 2010. 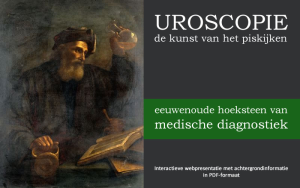 Uroscopy (classifying urine) was a medical diagnostic technique developed in Antiquity, particularly in the Byzantine East. During the Middle Ages it reached Western Europe and remained important until far into the Renaissance. This web application does not present any new views on this subject, but was created as a demo of multimedia scholarship. This is a selection of older applications, mostly in Flash. For more recent historical multimedia content, go to Imago1900.